On August 14, 2000, the Minister of Canadian Heritage, the Honourable Sheila Copps and Ontario's Minister of Natural Resources, the Honourable John Snobelen, announced that the Rideau Waterway was now a designated Canadian Heritage River. The Rideau Waterway was considered for CHRS recognition from Ottawa to Kingston for its outstanding historical and recreational values. Originally built for military use, it quickly became the "highway" for early settlement and commercial traffic. It has an absolutely unique assemblage of working historical buildings and engineering structures that is unequalled anywhere in Canada. The Rideau Canal National Historic Site of Canada, the core of the Rideau Waterway, was built between 1826 and 1832. 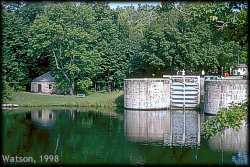 It is the oldest continuously operating canal in North America and is managed by Parks Canada. The Rideau Waterway is unique to the Canadian Heritage Rivers System in that it is the first waterway based on a Heritage Canal to be recognized as a Canadian Heritage River. Upper Lock and Blacksmith's Shop at Jones Falls. The Rideau Waterway is a cultural living landscape of villages, small towns, farms, cottages, cities, and private residences, all of which contribute to its wide appeal and unmistakable cachet. A healthy natural environment is the backdrop for recreation and heritage appreciation. The Rideau system is one of Canada's finest recreational waterways with extraordinary boating, cottaging, camping, fishing and hiking opportunities within an hour's drive of over one million people. In 1998, the Rideau Waterway Coordinating Committee, with active participation from many groups along the Rideau, including Friends of the Rideau, began work to seek the designation of the Rideau Waterway as a Canadian Heritage River. 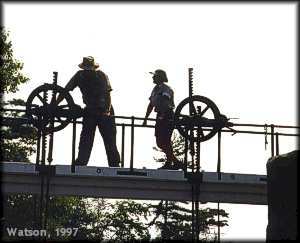 In November 1999, its nomination as a candidate Canadian Heritage River was accepted. Sound and sustainable economic development throughout the corridor is at the heart of the CHRS recognition. 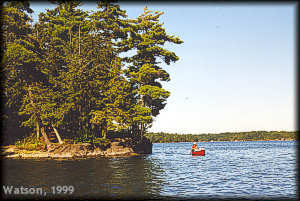 Rideau residents, lake associations, environmental groups, municipalities and other levels of government all actively participate in safeguarding the well-being of the Waterway's rich heritage including high water quality standards for fish and wildlife and the protection of scenic shorelines. The Canadian Heritage River status for the Rideau places it in the very elite company of 28 other designated Canadian rivers. Over 9,000 km of Canada's river heritage is recognized through the CHRS program for their pivotal role in shaping Canada's history and society.